We are fiber optic experts. We can install both single and multimode fiber, complete with testing and certification. Our technicians have been trained in fiber optic systems by Corning, a leading manufacturer of fiber optic communications system solutions for voice, data and video network applications worldwide. Corning Cable Systems develops and manufactures fiber optic cable, fiber optic and copper cable hardware and equipment including frames, cabinets, terminals, network interface devices, splice and test equipment, cable assemblies and fiber optic and copper connectors; as well as provides network services. We use Fluke's comprehensive line of testing tools, giving us the ability to troubleshoot complex systems and detect problems quickly. Our commitment to total quality and superior customer satisfaction distinguishes us as a leader in the telecommunications industry. 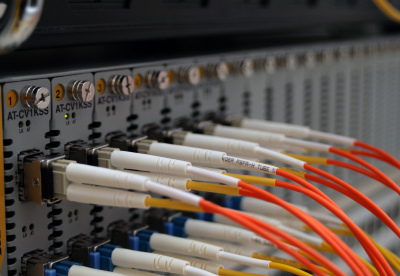 Fiber-optic systems revolutionized telecommunications. Let us show you how it can revolutionize your business.